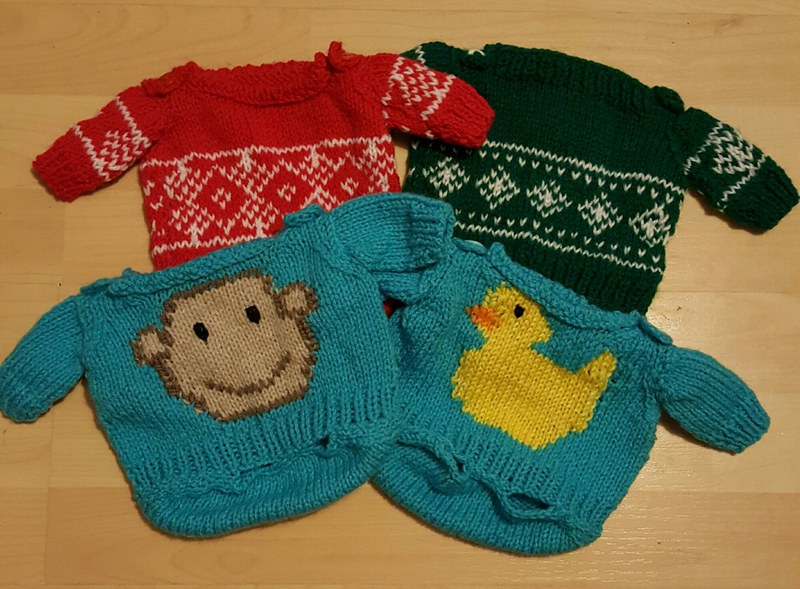 If you’ve been following you’ll know that I have been making jumpers for both of my godson’s toys (Monkey and Duck) for Christmas. If you’ve missed my posts, a brief summary is that I wrote patterns from the toys’ measurements and hoped for the best! Tonight I sewed on the final buttons, all four are finished. The last two were picture jumpers. I’m going to admit now that my intarsia work is best not viewed close up (the same goes for my Swiss darning!) However, I did it. I learned a new ‘thing’, I tried out designing (both of the pictures are my own designs!) and if nothing else I’ve learned that I will never attempt a person sized picture knit. I hope they like them, it’s been just over a month of counting, frogging, experimenting, sewing in ends and adjusting. A few things have left me disappointed, for some reason I really struggled sewing in the sleeves on the duck jumper. I’m just hoping it looks OK on the toy. The necklines are also a bit iffy, but I needed to have them able to open more so the toys can be put in them. From a distance I think they look pretty cute. Now to wrap and deliver them! Now I have to make 2 more (much smaller) gifts, but they are for just after Christmas. I also have two cards to make, and a lot of presents to wrap. Something tells me I will be busy until Christmas Eve! I’m sure your godson will adore them! Kudos on a job well done! They are properly BRILLIANT! I really love the picture knits particularly, but the other outfits are fab too. You are far too hard on yourself! Thank you, so sorry I didn’t see this before, naughty WordPress has been putting proper comments into the spam folder! ADORABLE x 4, Mrs. Craft!! OHHH Those are so SO lovely! I know you ‘play down’ your makes (all us crafters and makers do that, not sure why we do it, but we do), but if you didn’t look at these photographs for the next 12 months, then looked again at them this time next year, you’d see just a glimpse of what we are seeing when we look. Those darling little jumpers are perfection. They aren’t ‘home made’ they’re HAND MADE – and that makes a huge difference. They’re made by a textile artisan, and beautifully so. They would be sold in places like Liberty’s in London, England, which sells luxury goods; handmade items, and OOAK’s (One Of A Kinds). Congratulations on your truly GREAT MAKES, Mrs. Craft. Sending you squidges and warm wishes for a happy Christmas. wow! You are so busy and turn out such priceless treasures! Oh my gosh they are adorable! I am sure they will be cherished!